my daughter have a very fond attachment to her binky until her 3rd birthday. I told her that on her birthday, she had to throw it in the garbage. I was surprised how easily she gave it up and was even able to sleep at night without it. My son just got rid of his too (same as you, when he was three). When he was 1.5 we reduced it to bedtime and nap ONLY... then near his third birthday it got an "owie" (he only had one and the mouth part got a crack in it) so we put a bandaid on it and put it in a cup for a week. He checked it every day until we finally said it was time to give it to the garbage man. He never looked back, it was great! Oh, my little one too! He gave his to Santa for our dear friend's new baby twins. It was so heartwarming to see him do that. He had a semi-rough night that night, and has not looked back since. 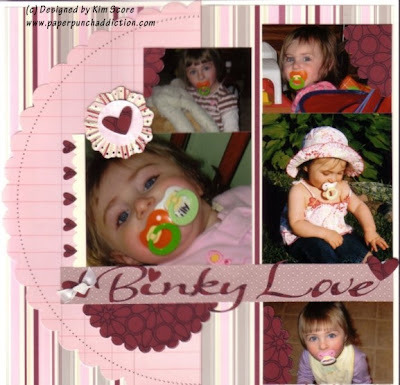 Kim this layout is absolutely adorable! My children too were Binky Lovers. I Just can't stop giggling at the double binky photo. It brings back such funny memories! Thanks for sharing this layout it brought a smile to me!